The lowest price on a new hot tub is found in the discount inflatable hot tub category. Inflatables start as low as around $500 and they are the most portable of all hot tubs. They are usually delivered in a managably sized box and inflate themselves in less than 10 minutes. These may be an ideal solution not only for those on a budget, but also for vacation homes and second homes, camping trips or other vacation destinations, decks, patios and other outdoor areas where a power outlet is available. Most of the inflatable spas have a built-in connection for using the spa pump to inflate the spa. Some also offer 1kw or 1.5kw heaters which help keep the water warm, while others only operate off of the heat generated by the pump. Most of these inflatables also come with a lockable, matching cover or lid to help maintain the water temperature when the spa is not in use and also prevent unauthorized access. The Silver Cloud Model B-110 seats up to 4 persons with 115 air jets, a 1HP air blower and 1.5kw heater. It operates at 120 volts and weighs just 70 lbs. empty. Warranty is 6 months on the spa pool and 12 months on any electrical parts. Find out more about the current deal on B-110 Silver Cloud here. This spa inflates in less than 5 minutes and contains the components under the spa shell so it is quieter than other units that have the pump mounted externally. For more about the Silver Cloud contact us by email and we will quote you a complete price including shipping. Please provide your town and postal code for the no-obligation quote. No salesperson will bother you unless you would like more information. The Camaro model B-130 inflatable spa not only features a luxurious design in black color, but also features 4 soft built-in seats for additional comfort. Who says an inflatable spa only allows for sitting at ground level without seats! If you want additional seats, this is your tub. At 71″ in diamter and a depth of 28″, it is roomy enough yet portable enough to use almost anywhere. 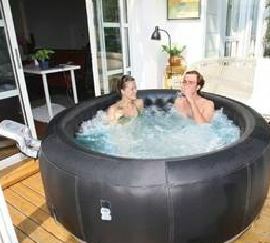 This inflatable hot tub accommodates up to 4 persons and is made of sturdy vinyl, PU leather and polyster laminated PVC. Find out more about the Camaro inflatable spa by sending us an email request or checking out the link above. Lowest Cost – Newest Addition is the Intex Model which is easy to set up, heats up quickly and the bubbles erupt from over 100 water outlets. Room for up to 4 persons.